The Automotive programs at Kwantlen Polytechnic University, a division of the Faculty of Trades and Technology, offer a range of courses and services that many students likely don’t know about. Most probably haven’t heard about how they can get their cars fixed at a rate lower than what’s offered at many other auto shops. The core of the department is the Automotive Service Technician program, wherein students spend one year learning foundational skills, followed by a potential three years working as an apprentice. Those who do choose to take part in an apprenticeship will work alongside a sponsoring employee while spending between six and seven weeks of the year returning to KPU to catch up with their schooling. In this way, graduates are fully equipped to find employment and have a successful career in the automotive industry by the time they have completed their training at the university. Dakota Wettlaufer, a third-year student in the apprenticeship program, says that he became interested in going to KPU after building cars in high school and engaging in ACE IT, a program offered to high school students which accelerates their progress through the first year of post-secondary education. Wettlaufer is currently completing his apprenticeship at a Canadian Tire near Surrey Central, where his brother, a recent graduate from KPU’s four-year program, is the shop foreman. Lee Grant, an automotive student in her first year, says that she hopes to work with old muscle cars in the future, but believes she’ll be happy with any position she can get after starting her apprenticeship. “Some days can be challenging because you kind of just get thrown in there, but it’s really good and I like it a lot,” she says. Similar programs to the Automotive Service Technician program have been offered at KPU in the past, ever since the construction of the university’s Surrey campus in 1990. Back then, the Automotive department was housed in a nearby shop, as the actual campus was little more than a group of portables on 140th Street. Now the shop is headquartered at the KPU Tech campus in Cloverdale, which was built in 2007. These days, the facility provides all of the industry essentials that one might find in an average auto shop including car lifts, tire changers, and spare engines. The department also provides access to higher-end industrial products such as body-scanners sold for $16,500 a piece. These are used by the third and fourth year students to assess problems in cars using a sophisticated computer software system. For now, only 16 students are accepted into the first year of the program on a biannual basis. Nearly all of the program’s graduates enter into the automotive workforce, and the department’s chair Gerard Sheehan says that work-placement is so high that KPU’s Automotive programs have “trouble keeping up with demand” for new graduates. If the department can afford it, Sheehan would gladly see an expansion of existing facilities and an increase in the number of students accepted into the program. Students and faculty who are interested in the Automotive programs are encouraged to come by and check out the shop. 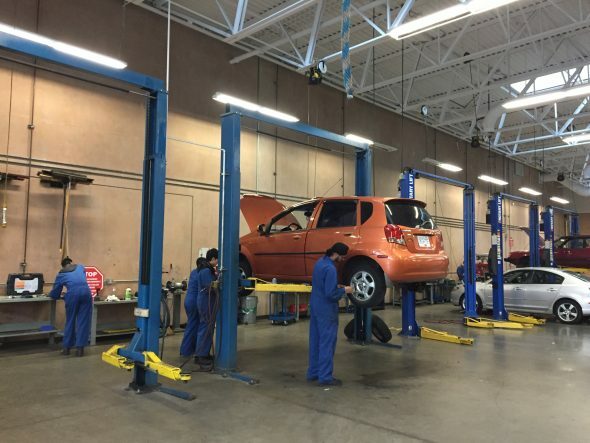 The department hosts an open house between two and three times a year, and if you’re lucky, you might be able to get those worn break pads replaced or a quick oil-change and some new tires. That only depends on how many students in the program have time to spare.